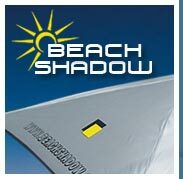 Beachshadow is a UPF+50 shade for use on the beach, in the garden or at any outdoor event. 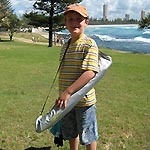 It is lightweight, portable and compact yet folds out to give 4 m² of guaranteed sun protection using our unique fabric. 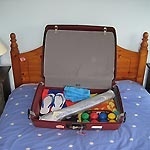 To see some of the different configurations in which you can use the Beachshadow, select the Different Configurations tab on the left hand side menu. To see a 23 second video of the protection our canopy gives, click here. 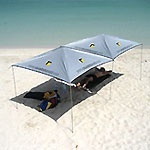 Beach Tent - Beach Tents Beach tents are the ideal solution for protecting you against the Ultra Violet Rays (UVR) of the sun. 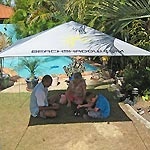 Beachshadow have developed the ultimate beach tent offering UPF 50+ sun protection for you and your family. 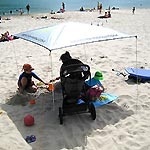 Beach tents are becoming the perfect method of keeping yourself in shade especially if the material has been tested to various internationally recognised standards, as is the case with Beachshadow. Beachshadow is also waterproof and offers a generous 4 square metres of UPF50+ sun protection whilst being portable, lightweight and very easy to assemble. 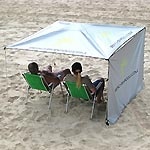 Beach Shelter - Beach Shelters - Beach Shade If you are going abroad on your holidays, you will find Beachshadow is a perfect companion for you and your family, it packs away to easily fit into a standard suitcase. 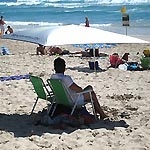 Beach shelters are not only ideal for protecting you against the harmful rays of the sun, but Beachshadow allows the breeze to flow through keeping you cool. 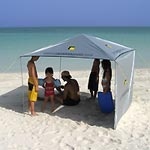 The beach shade provided by the Beachshadow will protect all the family and also comes with a windbreak.